Origin and Habitat: Tanzania, Eastern Arc Mountains & Coastal Forests. Encephalartos sclavoi occours in a very small small area of occupancy, is known from a single location, with a population of only 50 mature plants, and regeneration in habitat is prolific, with many seedlings and immature plants in evidence. Type locality: Tanzania, District Tanga, Gologolo, near Lushoto, within Shume Magamba Forest Reserve in the western Usambara Mountains, Tanga district of northeastern Tanzania. Altitude range: 1,800 to 2,100 metres above sea level. Habitat and Ecology: Grows on steep, relatively dry, south facing rocky slopes in grassland and on rocky outcrops surrounded by montane forest. Occurs between rocks on sheer precipitous granite and gneiss promontories. Rainfall is reported as high falling mainly in summer. This species is a critically endangered due to loss in the extent and quality of habitat and decline in the population due to collection by traditional healers and by cycad collectors. The area, because of its elevation has a mild climate and is considered an ideal place to live. So increases in human settlement and further changes in land use are likely. Natural and man made fires destroy seed and seedlings. 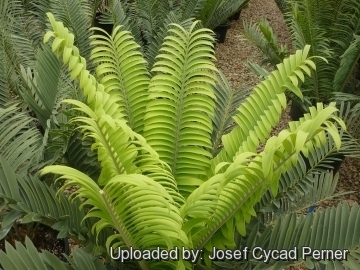 Description: Encephalartos sclavoi, also known as Sclavo's Cycad, is a very distinctive medium-to-large sized arborescent species that can form a well developed aerial trunk up to 1 m tall, 35 cm diameter. Very old specimens can clump and grow up to 3 trunks. 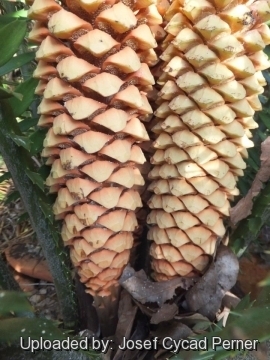 The most distinguishing feature for this species are its very thick broad leaflets and yellow stalked cones (short stalks in the pollen cones). The broad leathery leaflets, with their strongly revolute margins and downward overlapping arrangement, make it easily identifiable even in the absence of cones. 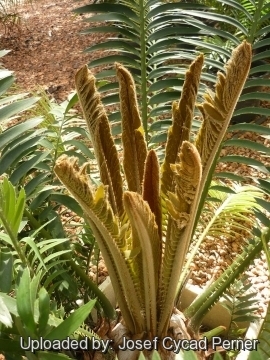 Encephalartos sclavoi is considered to be one of the most distinctive and handsome cycads. Described in 1990 by botanists Aldo Moretti, D.W. Stevenson and Paolo Deluca. Honoring Jean Pierre Sclavo of France, well-known student and collector of cycads, who discovered this species. Encephalartos sclavoi is very variable in its forms as in habitat the species is still evolving, to see it in habitat you would think that you have stumbled on someones collection of different species. Leaves: Semi-erect 170 to 200 centimetres long, dark green to blue-green and semiglossy, slightly keeled to flat in section; rachis green, straight, stiff or gently curved, somewhat lax, not spirally twisted or slightly twisted in some leaves; petiole straight, with 1-6 prickles; leaf-base collar not present; basal leaflets reducing to spines. Leaflets: Lanceolate, strongly discolorous, not lobed, insertion angle obtuse (45-80°); margins incurved; upper margin lightly toothed (1-3 teeth); lower margin lightly toothed (1-3 teeth); median leaflets 18-25 cm long, 30-40 mm wide. 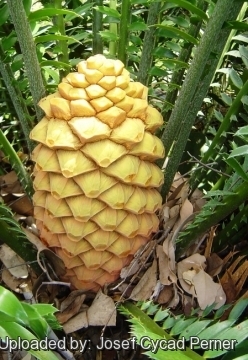 Male cones (pollen cones): 1-2, narrowly ovoid, yellow, 20-25 cm long, 10 cm in diameter. 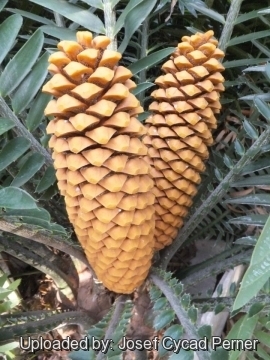 Female cones (seed cones): Yellow, 30 to 40 centimetres long and 15 to 20 centimetres in diameter.1-2, ovoid, yellow, 30-40 cm long, 15-20 cm in diameter. Seeds: Oblong, 25-30 mm long, 20 mm wide, sarcotesta yellow. Similar species: Encephalartos sclavoi is very similar in appearance to Encephalartos hildebrandtii. Notes: The existence of Encephalartos sclavoi was known for many years before it was described botanically. 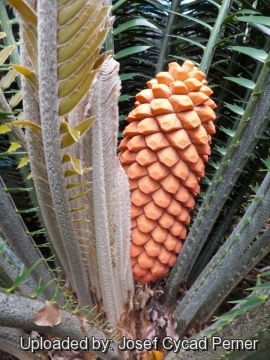 In January 1986 a French student of cycads, Jean-Pierre Sclavo, while prospecting for plants in Tanzania, recognized it as worthy of description. His notes and herbarium specimens were turned over to Aldo Moretti of the University of Naples, Italy, leading to the description of E. sclavoi in 1989. 1) Eastern Arc Mountains & Coastal Forests CEPF Plant Assessment Project and Donaldson, J.S. 2010. Encephalartos sclavoi. The IUCN Red List of Threatened Species 2010: e.T41924A10599377. http://dx.doi.org/10.2305/IUCN.UK.2010-3.RLTS.T41924A10599377.en . Downloaded on 20 September 2015. 4) Wikipedia contributors. "Encephalartos sclavoi." Wikipedia, The Free Encyclopedia. Wikipedia, The Free Encyclopedia, 1 Aug. 2015. Web. 20 Sep. 2015. 5) wild-about-you.com contributors. "Encephalartos sclavoi." <http://www.wild-about-you.com/AfricaCycads.htm> Web. 20 Sep. 2015. 6) Stevenson DW, Moretti A, De-Luca P, “Encephalartos sclavoi De Luca, D.Stevenson and Moretti (Zamiaceae), a new species from Tanzania” in Delpinoa 29-30: 3-5.1989. 7) Goode D. “Cycads of Africa.” Struik Winchester 1989. 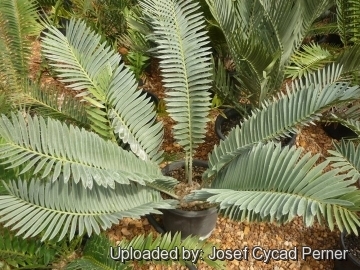 8) PACSOA contributors “Encephalartos sclavoi.” In: Cycads. 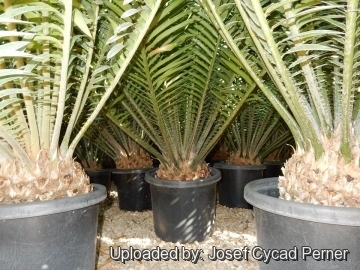 Palm and Cycad Societies of Australia (PACSOA) <http://www.pacsoa.org.au/wiki/Encephalartos_sclavoi>. 24 November 2013, Web. 28 August 2015. Cultivation and Propagation: Encephalartos sclavoi is an adaptable plant well suited to warm temperate and subtropical climates. It is more moisture-tolerant than most South African cycads. Even though the habitat of E. sclavoi is close to the equator, the high elevation at which it occurs gives it a remarkable degree of cold tolerance. It can also be grown in full sun without its leaves burning. It is long lived and moderately fast growing. Its beauty and ease of horticulture make it one of the finest cycads for use in the garden. 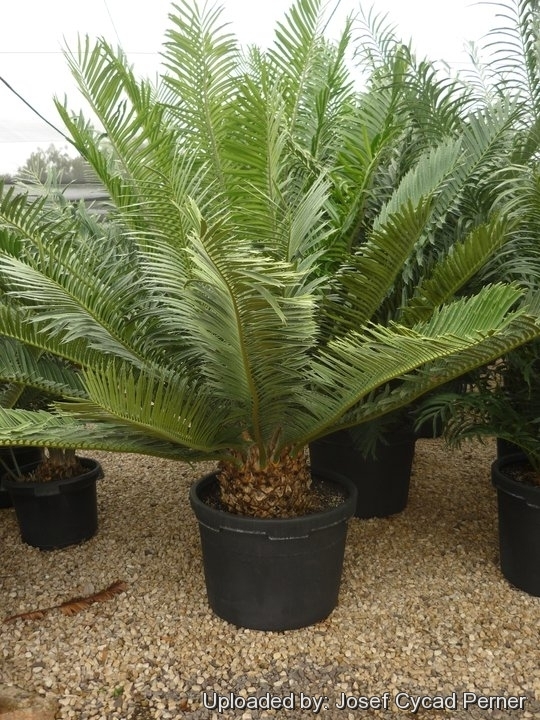 As a garden plant, this cycad will usually hold two or three crowns of leaves, all in good condition. Waterings: In cultivation prefers moist soil with good drainage for optimal growth. But it is eventually drought resistant. Exposure: It thrives and grows best in full sun or partial shade. Propagation: It may be propagated by seeds. They are among the easiest plants to germinate. Traditional uses: The seeds are harvested for medicinal purposes by traditional healers.